British MPs have adopted a cross-party Brexit amendment that allows parliament to seize control of the House of Commons agenda to hold a series of indicative votes. The amendment put forward by Tory MP Oliver Letwin changes the rules of parliament in order to provide time for so-called indicative votes on Brexit options. The move could potentially pave the way for a "softer" deal that keeps the UK closer to Brussels. 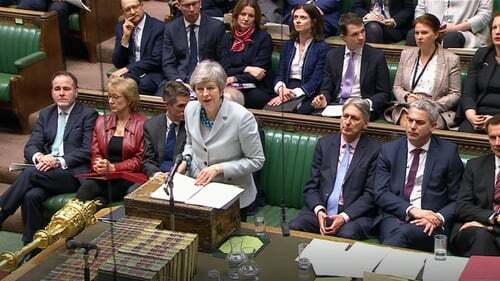 The commons voted by 327 votes to 300 - a majority of 27 - for a cross-party amendment to enable MPs to stage a series of "indicative votes" on alternatives to Prime Minister Theresa May's deal. The vote came as three junior ministers announced they were quitting the government. Foreign Office minister Alistair Burt and health minister Steve Brine resigned, while business minister Richard Harrington announced his decision to leave government on Twitter. Mr Harrington accused the the government of "playing roulette" with the lives and livelihoods of the people of Britain in its handling of Brexit. The result is another humiliation for Mrs May, who earlier warned MPs not to "overturn the balance of our democratic institutions" which means the government normally controls business of the house. She made clear she would not feel bound by the result of any indicative votes, which could include a "softer" Norway-style deal, or a second referendum. The Brexit ministry said in a statement it was "disappointing" that the vote had been adopted by parliament and warned that "any options considered must be deliverable in negotiations with the EU". Earlier, Mrs May acknowledged that there was not enough support in the House of Commons for her to bring back her Brexit deal for a third "meaningful vote". But she said she would continue her efforts to build support for the deal - defeated by 230 votes in January and 149 votes in March - and stage a vote before the end of the week. The European Council has set a deadline of Friday for Mrs May to secure parliamentary approval for her Withdrawal Agreement if the UK is to leave the EU with a deal on 22 May. If she cannot get it through the commons, then the UK has until 12 April to propose a different approach or crash out of the EU without a deal. In a statement to the House of Commons, Mrs May said she regretted having to delay Brexit beyond the scheduled date of 29 March. But she cautioned MPs against seeking to obstruct a statutory instrument tabled on Monday, which will remove the date from Brexit legislation, warning that this would "cause legal confusion and uncertainty but it would not have any effect on the date of our exit".